Legal matters are daunting and completing the process is often tedious and confusing. We are here to take the guess work out of the publication requirements and submissions. 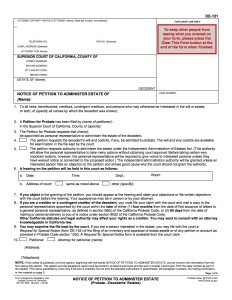 All legal notices, including probate (petition to administer estate), notice to creditors, trustee sales, lien sales, city legal ads, summons, including both civil and family summons, name changes, and fictitious business names should be emailed to legals@coastnewsgroup.com or faxed to 760-274-2352. Once received, we will respond with a quote and information on how to proceed. Below you will see instructions on how to submit the most common legal notices for publication. The deadline for all legal notices is 2pm on Tuesday for that Friday publication date. PUBLICATION REQUIREMENTS: FBN’s must be published for 4 consecutive weeks in order to be finalized. The first week of publication MUST be within 30 days of filing. The County allows no room for error with this rule so make sure you get us your paperwork in time. The deadline for all legal notices is Tuesday at 2pm for that Friday’s paper. 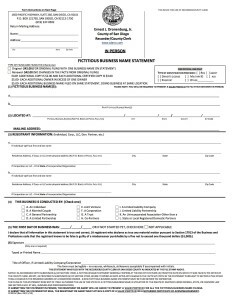 WHAT WE NEED: Email the completed form above, after receiving the County’s stamp of approval on the back, to legals@coastnewsgroup.com, fax to 760-274-2352 or bring the paperwork by our office at 315 S Coast HWY 101, Suite W (above Leucadia Pizzeria) Encinitas, CA 92024. Once your paperwork is in and payment information has been secured, we handle the rest of the process for you. At the end of the 4 weeks, we mail proof of publication to the County on your behalf and send you a copy for your records. PUBLICATION REQUIREMENTS: A Legal Name Change or Order to Show Cause must be published for 4 weeks prior to your court date. After the fourth week of publication, we will submit an affidavit directly to the Court to verify that you have fulfilled your publication requirements. The Courts demand that the affidavit be submitted a minimum of 10 days before the court date. 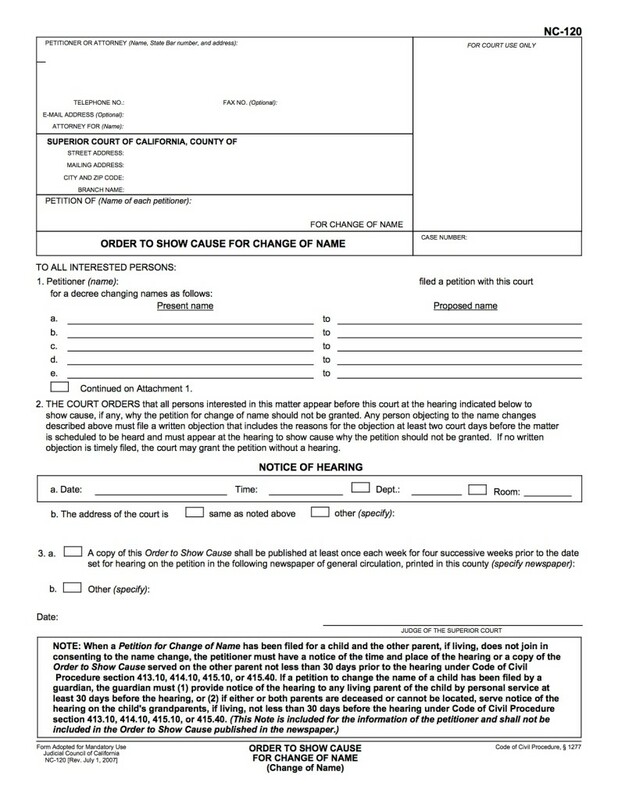 WHAT WE NEED: Upon filing with the Court, please email a copy of the NC120 form pictured above to legals@coastnewsgroup.com, fax to 760-274-2352 or bring in person to 315 S Coast HWY 101, Suite W, Encinitas, CA 92024. Keep in mind that the deadline for all legal notices is 2pm on Tuesday for that Friday publication date. 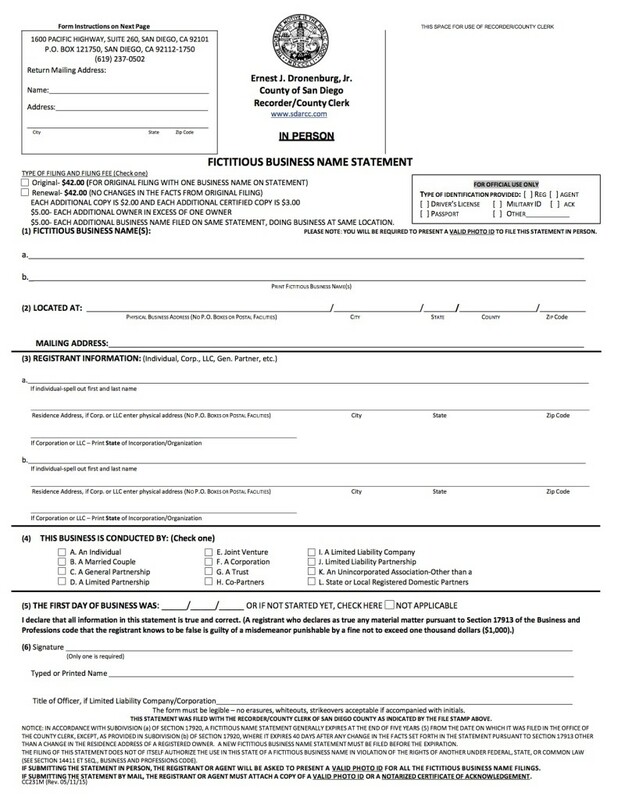 We suggest you submit your paperwork as soon as possible in order to meet the Court’s deadline for affidavit submittals. PUBLICATION REQUIREMENTS: Petitions to Administer Estate or Probate notices must be publish for 3 weeks. The only office that handles probate cases is in downtown San Diego at the Madge Bradley Building 1409 Fourth Ave. San Diego, CA 92101. The office only handles probate issues from 8 – 11am Monday through Thursdays and some Fridays. 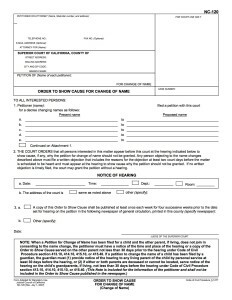 We submit affidavit of publication to the courts on your behalf. WHAT WE NEED: Please scan and email your DE121 to legals@coastnewsgroup or fax it to 760-274-2352 as soon as possible. The deadline for all legal notices is 2pm on Tuesday for that Friday publication date.